Clear Lake, Iowa; February 3, 1959 just before 1:00 a.m. The wind howls at 30+ mph on a biting winter night as a light snow begins to fall on the deep frozen plains. The weather is deteriorating faster than the forecasters called for. The clouds are closing in, with visibility dropping quickly. The stars will soon be obscured, the night pitch black. At the Mason Municipal Airport, a small Beechcraft Bonanza, piloted by 21 year-old Roger Peterson, taxis onto the runway carrying three passengers. With its 165hp Continental engine barking defiantly against the arctic gale, the plane takes off to the south, then banks north, headed for Fargo, North Dakota. Its owner, Jonathan Dwyer, stands alone in the night and watches the gathering clouds swallow the flashing red tail beacon. It disappears, leaving only the wail of the night. "It's better to burn out, than to fade away." 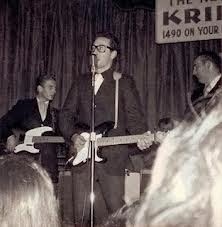 Buddy Holly at the Surf Ballroom in Clear Lake, Iowa. February 2, 1959. Jennings (L) is also seen. Thus, 55 years ago this week, Buddy Holly, Richie Valens, and J.P. "Big Bopper" Richardson flew into eternity. Barely six miles from the airport, the Bonanza was shattered across an icy corn field and the brilliant young stars on board were given to the Ages. Holly was 22; Valens 17. You may be familiar with the tragic details (many of which were memorialized in the 1987 film, La Bamba). Holly chartered the plane because the school bus the artists were using for their Midwestern "Winter Dance Party" tour had a busted heater and he wanted to make the next stop in time to rest and wash clothes. Valens, who had a fear of flying after watching two planes collide above his middle school playground, won his seat on the doomed plane in a coin flip. Richardson had the flu and was given his seat on the plane by a member of Holly's backing band named Waylon Jennings. When he found out Jennings would not fly, Holly quipped, "Well, I hope your ol' bus freezes up." Jennings responded, "Well, I hope your ol' plane crashes." Aircraft, drugs, and fast machines have taken too many of Rock's legends too early. While it's painful to consider what could have been, I try to take solace in what was avoided. Holly left us as his star exploded. The world only ever knew him as a glowing, smiling, youthful ball of kinetic musical energy, ripping at musical conventions in his black, thick-framed glasses with Texas-born fire; helping to fuse Rock to Roll. He never had to endure the indignity of muddling through worn out hits on the casino circuit or not waking up in some hotel room with a needle stuck in his arm. He got to the Top, then he was gone. "A love for real, not fade away." Holly was one of the Mercury astronauts of Rock (think Elvis, Chuck Berry, Carl Perkins, Bo Diddley), leaving a mark on its early history that was as vivid as it was indelible. It would be easier to list the Rock bands that have not covered him. (According to one source, no less than 83 bands have recorded "Peggy Sue.") This week, we will celebrate the 50th anniversary of the Beatles first performance on the Ed Sullivan show. As you watch the news, consider the first question that popped into John Lennon's mind as he walked onto what was then the biggest stage on earth: "Was this the stage that Buddy Holly played on?" Despite being gone before his 23rd birthday and committing only 40 or so songs to tape, Holly was named Rolling Stone's 13th Greatest Artist in Rock history. You think Rivers Cuomo or the hipster at the nearest coffee shop would be wearing horn-rimmed glasses if it wasn't for Buddy Holly? I doubt it. The topic of Holly's greatest and most enduring song, is permanence; not of life or the physical, but of love. His body left us in that frigid Iowa corn field, but the Cat was out of the Bag by then. He'd met the imperative he set for himself in a manner that would reverberate through the Musical decades. Don McLean had it wrong. The Music didn't die on February 3, 1959. It was just beginning. "A love to last more than one day. A love that's real - not fade away."